Chickens are social birds who enjoy the company of their flock. Despite their sociability, they maintain a definite hierarchy in their flock. Chickens work out their pecking order to determine who eats, roosts, drinks and mates first. A peaceful flock has a well-established pecking order, though birds sometimes challenge each other to move higher. When chickens are young, it's pretty tough to distinguish between hens and roosters. If they haven't celebrated their first birthdays, hens are called pullets and roosters are referred to as cockerels. The person who knows his way around chicken anatomy can determine a newly hatched chick's gender by looking at the vent. This can be tricky and takes an experienced eye to correctly determine gender, so many chick owners wait and watch to learn what's in their flock. When the birds are about 3 months old, their feathers will begin to develop, providing clues about the makeup of the flock. The saddle feathers, at the front of the tail, will be long and pointy on a cockerel and the pullet's will be rounded. As the cockerel grows into a rooster, some tail feathers will become long and curving. 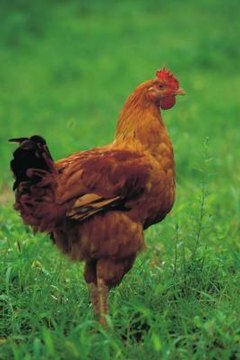 Both roosters and hens have wattles -- the red, fleshy growths hanging from their beaks -- and combs, the growths on top of their heads. Roosters tend to have larger wattles and combs than hens. Both can have spurs on their legs, but if hens have them, they're smaller than the roosters' spurs. Rulers of the roost, the males tend to be bolder and friendlier to people when they're youngsters. That often changes as the chickens age, with hens warming up to others as roosters become more aloof as they grow older. All chickens may fight, but roosters are more violent in their conflict. When it's time to mate, roosters will do a mating dance for the hens, dropping a wing and dancing in a circle. Chickens can be very vocal, as anyone who's heard a rooster crow knows. They're able to express more than 30 different sounds and have keen hearing. Hens use special sounds to lure their chicks and cackle when they lay eggs. They've even been heard crowing. Roosters start crowing around 4 or 5 months of age and make other noises, including warning sounds when predators are near. They also make noises to lure hens to food or to follow them. Some chickens are unlucky, whether they're hens or roosters, because they end up on the dinner plate. Roosters have a particularly tough draw because they're not desirable to many people raising chickens. Hens produce eggs, making them a popular addition to even the most casual farmer. Roosters are great at protecting hens, but too many roosters can mean violent fights in the roost. As a result, many roosters are killed as soon as they're identified as male when they're baby chicks. Others are turned loose in a variety of settings to fend for themselves. The guy that ends up ruling the roost is a lucky rooster indeed. University of Illinois Extension Incubation and Embryology: What Is a Chicken? How Do Flamingos Greet Each Other?